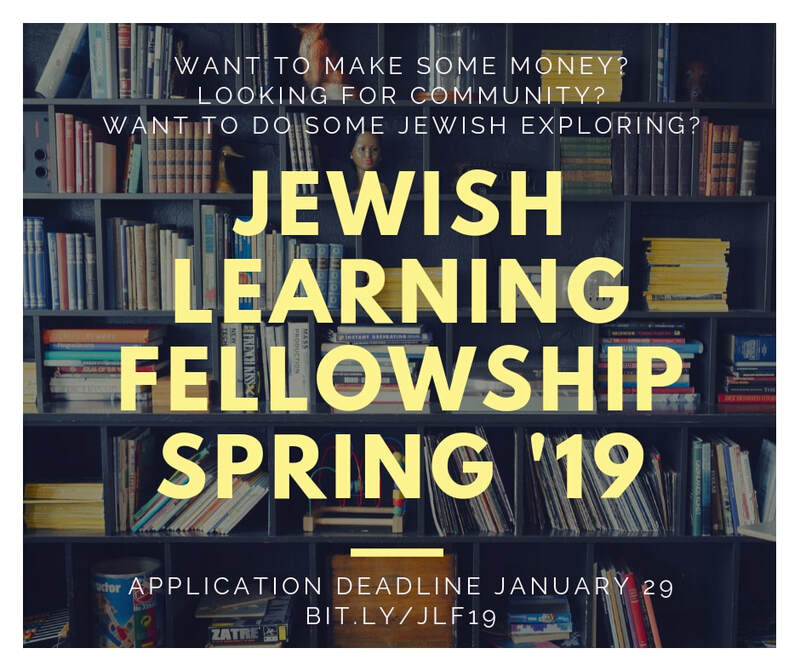 The Jewish Learning Fellowship (JLF) is a 8-10 week experiential, conversational seminar for students looking to deepen their understanding of Judaism on their own terms. We are proud to say that we make no claims about the “right” way to practice or not to practice Judaism. Our job is to help you explore the tradition in a safe space and find your own place, on your terms, in Judaism’s Great Conversation. For information about JLF, contact Raffi, OU-JLIC Rabbi and Senior Jewish Educator. JLF is a 8 week seminar taught by Jewish Educators at Hillel. We’ll break bread together each week. We’re also going to invite you to coffee, spend a Shabbat together, and help you feel connected to next steps and alumni offerings after JLF ends. Fellows can earn a $250 stipend at the end of the program. Fellows will spend 1-2 Friday evenings together during JLF, either on campus or in the home of one of their JLF educators. This is a chance to share time with one another outside of our seminar, break bread together, and experience Shabbat...whether it's our first time or our fiftieth. Is it important to make time for learning? Are there differences between academic learning, Jewish learning and life learning? How do we see ourselves as learners and what do we need to get the most out of our respective learning environments? What motivated you to be a part of this fellowship, where one of the only prerequisites is a desire to learn Jewish sources, learn about yourself, and your peers? Week 2: How Big is Your Story? In what way does personal history become collective history? Can history “make a claim” on us? What is your story? Week 3: Community of Memory vs. Lifestyle Enclave? Why do we create community? And why Jewish community? Why and how do we choose to be a part of it? What is the difference between a community, a group of friends and a social network? What makes a community a community? How might we interact with the idea of a Sabbath as college students? Is Shabbat, as a time of rest, inherently counter-cultural? Or could it support us holistically in our modern lifestyles and pursuits? How can the essence of Shabbat help us create a “rest practice” in our modern lives? What are the challenges and opportunities of a deep friendship? What are necessary qualities in a good friend and what qualities do you want to emulate as a good friend? What are the disqualifying qualities in a good friend? What role does honesty play in friendship? Week 6: Passover as Story: What is My Identity? How do stories help us form, explore, and express identity? What are the various facets of identity that are represented in the Haggadah? What is the significance of having one shared text that holds many perspectives? Week 7: How Do We Disagree? How do we disagree and engage in conflict? Can conflict be productive? What is the role of healthy vs. unhealthy disagreement and how do we engage in it rather than withdraw from it? Can disagreement serve as a critical part of uncovering truth? Is collaboration important? What are the ingredients of a good partnership or collaboration, and how do we cultivate it? Does entering into authentic collaboration have the potential to change us, and how do fully offer our talents and “get out of our own way” when collaborating? Is the end product/result better when we collaborate or work alone? students, what prevents us from allowing ourselves intimacy and vulnerability with another person? By learning the traditional wisdom of our Jewish sources, might we be inspired to approach our romantic relationships with a new lens that fuses our contemporary lives with traditional wisdom around intimate relationships? How can we encounter big questions, serious internal ambiguity, or wrestle with fundamental ideas and concepts, and still continue to learn and grow? How can we live out our lives with new questions, even if we don’t yet have the answers we desire? What is the value in uncertainty? How do we go about sitting or struggling with not knowing? What are the questions you’ve never had a chance to ask? How do we say goodbye to one another in a way that honors the time we have spent together? How is JLF different from other programs? JLF is run by Hillel International’s Office of Innovation, in partnership with local campuses and communities. Our educators bring to bear a wide variety of Jewish backgrounds, experiences, and philosophies. Some of them are rabbis. You can get a stipend for participating in JLF, if you like. We are also a pluralistic, non-denominational project. We do not believe there is “one right way to be Jewish.” We also have a cooler looking logo. What do I have to do to earn the $250 stipend? It’s only about the money for you, huh? To receive the stipend you must (1) Attend all eight sessions on time and attentively, and (2) Attend a Shabbat evening experience. ​Who is eligible to apply for the fellowship? Since most JLF seminars meet at a local campus Hillel, eligible applicants are currently enrolled as undergraduate students at that university or one of its affiliates. While JLF is a program rooted in Jewish study and in Jewish community, we do not discriminate based on race, ethnicity, religion, or sexual orientation. Do I need a certain Jewish background to participate? No, no background is necessary. JLF is open to students from a wide variety of Jewish backgrounds, expressions, and experiences! JLF meets once a week, for 8-10 weeks, for an hour and a half. And we feed you. You have to eat sometime, right? Additionally, to make it worth your while, you should know that Fellows earn a $250 stipend at the end of the semester. Each seminar will have approximately 20 fellows. Do I have to wear a black hat or grow a beard to participate? Um, no. We usually wear jeans, but you do you. Applications will generally be available twice a year, once in the Fall and once in the Spring. Once you complete the brief application, you may be invited in for an interview. The latest application is HERE.